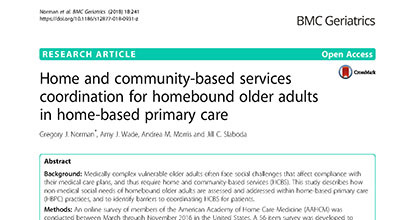 (HBPC) practices, and to identify barriers to coordinating HCBS for patients. assess HBPC practice characteristics and how practices identify social needs and coordinate and evaluate HCBS. physicians, 24% were nurse practitioners, and 32% were administrators or other HBPC team members. practices reporting it was ‘difficult’ or ‘very difficult’ to coordinate HCBS (OR from 2.49 to 3.94, p-values < .05). and scale care model partnerships between medical and non-medical service providers within HBPC practices.